We visited Craig’s studio in Alexandria and were struck immediately by the careful composition and elegant tonality of his work. “Inspired craftsman” comes to mind but does not do justice to the visual impact of his varied portfolios. 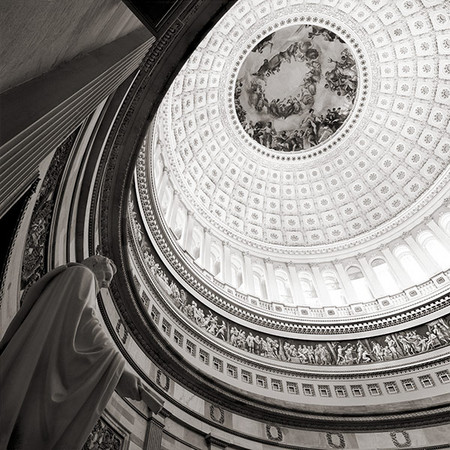 What draws you to photographing DC architecture? I have always loved the classics … painting, sculpture, films and architecture. In short … less is more … color can be so literal. In my opinion, black and white imagery leaves more to the imagination … it has a feeling of timelessness … It takes you back … It stirs your imagination. I think people in general have a greater response to black and white vs. color. I strive to set a mood for my images by printing in a tonality that helps create a sense of intimacy … thus drawing the viewer into the image. Who are your inspirations and what is it that you build upon in their work? Having studied photography in the early 70s on the west coast, Ansel Adams had tremendous influence on the technical aspect of my craft. Visually, creatively and esthetically, I have always been drawn to the work of Brassai and Atget, especially their night images. Their influence is evident in my night time images of DC architecture as well as the work I have done in Italy and Paris. Today, I would say the work of Michael Kenna inspires me most. I love his simplicity and elegance. Kenna’s work is so far removed from the landscapes of Ansel Adams and Edward and Brett Weston. Just an opinion, but I think the traditional landscape in the genre of Adams and Weston is for now dormant. What is your current direction with your photography? I am striving for more simplicity … less complexity of composition … Of course in black and white! I have been focusing lately on “the passage of time,” utilizing water and sky as subject matter. I think my work will always be more about creating a beautiful image as opposed to creating something of concept only. For me, beauty trumps concept!